Her violin technique has been influenced by a number of significant teachers, most recently Howard Davis and Levon Chillingirian. But she attributes her solid technique to her earlier studies with Russian teachers, including Igor Petrushevsky. ‘Russian violin technique is very into the string. It’s great for winning competitions because you have a huge sound and you blow the audience away. You can’t really loose a competition once you’ve got that sound.’ But moving away from the Russian approach also had its benefits. ‘It was when I left the Russian system that I started to be able to play in public properly. Before I used to get so stuck, but when I moved away from this Russian technique I found I was able to relax on stage and communicate better with the audience.’ Russian music remains close to her heart though, and the music of Tchaikovsky and Prokofiev makes regular appearances in her recital programmes. And looking to the future: ‘My next duo recital is in September in York. I am also involved in a commercial project, a girl group with three electric violins. I’ve never done anything like this before, so it’s going to be...different. Next year I am hopefully going to be doing the Beethoven Violin Concerto with the Beethoven Chamber Orchestra in London. I also hope to record a CD for the Landor label, either the Greig sonatas or some French music, Faure, Ravel or possibly some pieces by Lili Boulanger. 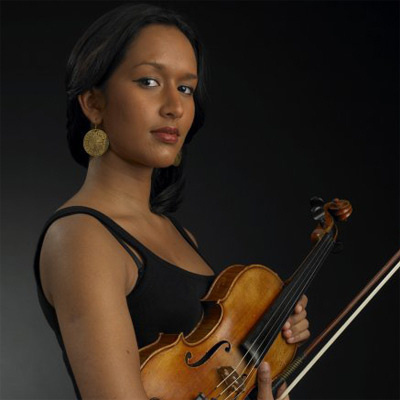 They’re salon pieces, the Boulanger, so pretty and the audiences really love them, and they are not much recorded.’ A typically diverse range of projects, then, and opportunities for Mandhira to further expand her already varied musical portfolio. Creativity, imagination and a taste for new challenges underpin all of Mandhira’s musical activities; they are the foundations for what is sure to be a successful and distinctive musical career.